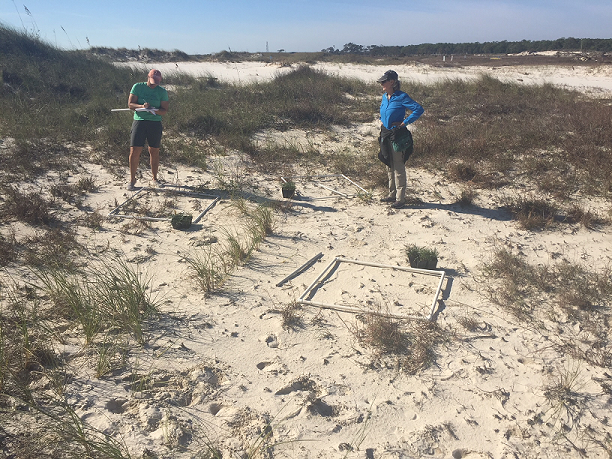 Researchers from the University of Florida monitoring dune restoration. Adaptive management is a process involving fine-tuning both the restoration projects and the entire restoration program over time, based on monitoring results and improved scientific understanding. The process creates an expanding base of knowledge that supports current and future restoration decision-making and further refines which restoration approaches are most effective for different resources and environmental settings. The Trustees presented a general monitoring and adaptive management framework in the Programmatic Restoration Plan to guide Deepwater Horizon restoration efforts. From that framework came the Monitoring and Adaptive Management Manual, released in January 2018, to provide guidance for monitoring needed to evaluate restoration outcomes and benefits to injured resources. Additional ecological monitoring and other scientific activities may be needed to address information gaps and improve restoration planning and implementation. This process allows us to proceed with restoration now, without waiting to resolve every scientific question first. Trustees Approve and Release the First Manual for Monitoring and Adaptive Management. Monitoring and Adaptive Management Procedures and Guidelines Manual Version 1.0 (PDF, 122 pg). Monitoring and Adaptive Management Fact Sheet (PDF, 1 pg). Cross-TIG Monitoring and Adaptive Management work group project page. Monitoring and adaptive management framework guiding Deepwater Horizon restoration.